The shops and houses on Bank Road, just above the Oak Road turning where Bank Road is at its widest. The spire of the Wesleyan Methodist Chapel, now the Matlock Methodist and United Reformed Church, rises from the church behind the buildings and dominates the view. Just a few years beforehand the young women would have been unable to walk down the centre of the road, but the trams had ceased to run up and down the Bank and all traces of it had been removed. The street is almost traffic free apart from a small motor cycle parked outside the bottom shop and a very few vehicles close to Crown Square. 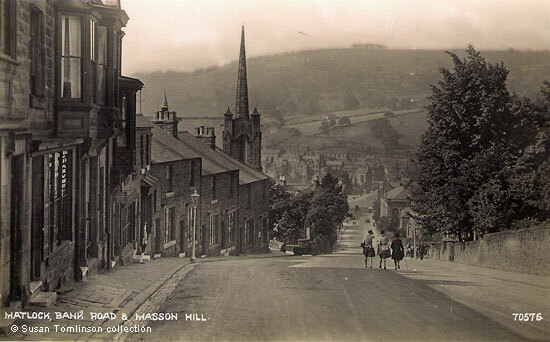 On 16th April 1930 the Matlocks Urban Council's annual licensing meeting discussed a Matlock Bank bus service to replace the tram service that Bank Road residents had made use of for thirty-four years. This was at the suggestion Mr. C. F. White, who had been one of the most vociferous opposers of the tram. Although several members expressed themselves in favour of the proposal if it did not interfere with the services to the Bank that already been set up, a bus service that went up Bank Road from its base in Crown Square up to the top of Rutland Street was never introduced. On the left hand side of the road is a gas lamp, which helps to date the picture to before mid 1937. On 19th August that year Matlock UDC held a special meeting to discuss the question of street lighting during the forthcoming winter as their contract with the Sheffield Gas Co. was to expire at the beginning of September. Unfortunately, there were only six Councillors present but it was nevertheless felt that something must be settled as the Council had been discussing converting the lamps from gas to electricity (produced by the Derbyshire and Notts Electric Power Company) for a while. They had to decide whether to convert a hundred lamps, a process that was estimated to take ten to twelve weeks. Whilst the general question of street lighting was deferred to the next season, a resolution was carried to convert the street lighting of Bank Road and Rutland Street to electricity. Information researched, written by and © Ann Andrews. Intended for personal use only. "Derby Daily Telegraph", 15 April 1930. "Derby Daily Telegraph", 20 August 1937. Twelve Councillors were not present at the meeting, so double the number who had attended. This made decision making difficult for the six who had turned up.